If you’re looking for reliable towing services in San Rafael you have come to the right place. Newway Towing is a local towing vendor which provides prompt, professional towing and roadside assistance services to the San Rafael drivers. The company provides a full range of towing and roadside services through a network of independently owned and licensed affiliates. No problem is too big or too small for Newway Towing. Newway Towing prides itself on its excellent customer service and works hard to keep it up. We work around the clock to make sure we’re available to every customer who needs our help, whether it’s late at night, early morning or even on weekends. You’ll find us working 24/7 – 365 days a year! And, we have a policy of a fast arrival time to all calls in San Rafael, we don’t intend to let you wait. What can we say? We are proud of our team of expert operators and we love telling everyone about them. Our team members are all very well trained and have years of experience out on the roads. Besides their extensive training and qualifications all our team frequently retrain, in order to keep up with all new innovations in the field. All members of the team are familiar with all makes and models of cars as well as motorcycles, so you can be sure that we will take good care of your vehicle. 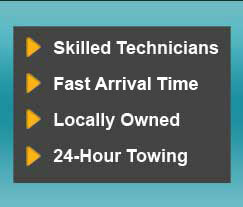 Newway Towing has a large fleet of tow trucks, we have the right type of tow truck for every occasion. The team makes sure to keep our tow trucks well maintained, so they are ready for each call. We also make sure to equip our trucks with the latest towing equipment, to make our job easier and to tow your car faster. Our team is very safety conscious, and this is apparent in our work. Give us a call if you need emergency towing services and we’ll send someone out right away. We can also schedule long distance towing over the phone and we are always happy to answer any questions you might have at any time. Newway Towing recommends saving our phone number in your mobile phone so you won’t have to search for it if you need emergency towing.